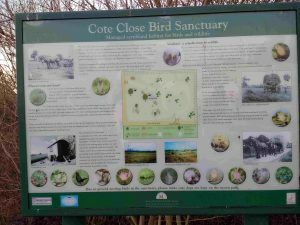 This bird sanctuary has been created on land, which was used for growing cereal crops, prior to the A50 trunk road being built in 1996. The Cotton family, who lived at East Farm, Stenson, farmed the land. It was ultimately purchased by the Highways Agency as part of the road-building programme. Following the completion of the road, the land was leased to Findern Parish Council by the Highways Agency for this project. Cote Close is the old-field name, which dates back before the Enclosures Award Map of 1781. It is believed that it was named after the cotes, or small wooden huts, that were used at the time to give shelter to shepherds. Close was the name of a small enclosure. It is possible that there were a number of such ‘closes’ on this land. On a section of this field was a marl pit, from which clay was dug when the Trent & Mersey Canal was constructed through Findern in 1773. Over subsequent years, villagers filled the hole with anything they wished to dispose of, and so consequently crops were less successful on this spot! Findern Footpaths Group began work on this sanctuary in 2006. Paths were mown and access gates were installed. Fruiting trees such as hawthorn, blackthorn, guelder rose, dog rose and crab apple have been planted in clusters. They are maintained in mixed age structure by cutting in rotation, as this is more attractive to birds. The surrounding grass is left to grow long. It will provide nesting sites for some birds and feeding areas for others. The wild flowers in the site are a nectar source for insects and the seeds will provide food for birds and small mammals. Dead wood and leaf matter is vital for the survival of many insects and fungi. In addition to many familiar resident and migrating breeding birds such as thrushes, robins and chaffinch which may be seen here, you may be lucky enough to spot less expected species, such as lesser whitethroat, willow warblers and goldfinches. Cotes, or small wooden huts, were used to give shelter to shepherds. His work was hard and physical with flocks having to be moved daily and the shepherd had to have somewhere to eat, rest and sleep, especially during the lambing season. The Shepherd’s Hut was basic accommodation with one room in which the shepherd ate, slept and stored his equipment. It had a stove in one corner for warmth and cooking, and a window on each side so the shepherd could see the flock. The hinged stable door, which never faced the prevailing wind, enabled him to hear the sheep. The hut had strong axles with cast iron wheels, which enabled the shepherd to move the hut from field to field as he needed to. It also had to be strong enough to withstand constant movement. A wildflower planting programme and the installation of an information board and seating completed the project during 2007. We were delighted to welcome Mark Todd MP South Derbyshire when he came along on October 5 2007 to formally open the site for us, in the presence of Cllr M Bale, Chair South Derbyshire District Council. This happy occasion completed a successful project!